This is a recipe my Mom has made, specially in September (Chilean independence’s day) ever since I can remember, I LOVE empanadas! So now I’m sharing our recipe with all of you, we did all the conversions and replaced the ingredients to cook them in California. So get your ingredients together because this is not just fun, is SOOO YUMMY! Cook the ground beef with olive oil, garlic, salt, paprika, pepper and oregano at slow temperature. Once it’s completely cook, add the chopped onions and cook high temperature for 5 minutes, after that set on low temperature until onions are cook and mix is juicy. Slice eggs and pour olives on a bowl, all the fillings are ready! Set you work area, roll the dough and fill. After filling run you finger with warm water on the edge so the empanada is sealed. Press carefully and cut the extra. you can close them the way you want , but I listed here the instructions for my favorite, they just look so cute! After they are all done we brush the top with egg yolk so they look more glittery and brown. and here they are all ready!, steamy and YUMMY! I was looking for a recipe for Chilean empanadas and the one posted here seems to be so rich and look so delicious I’ll be sure to try soon. Thanks for a beautiful step-by-step orientation, loved to read your story. Congratularions on your wedding and best wishes, always. These look just like the one my Mimi used to make! I am stealing your recipe. I’m going to impress the fam at the next gathering. Thank you for an amazing tutorial! This looks delicious!!! 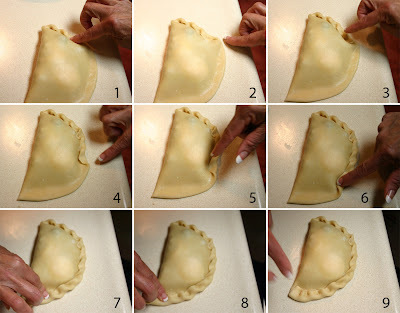 my mum and I are going to try making your empanadas! thank you for posting! We going to eat the Empanadas with any kind of sauce or dipping or eat them just like that . Do you have a pebre recipe to share? If so, I would love to have it. Have I missed something? Are there no raisins in your recipe. Your tutorial is excellent. I have never been able to get the edges turned as nicely. Will be preparing tomorrow, but with some raisins. I just baked my last two. I made them about 7 months ago. ( maybe even longer) I cant remember. Anyhow, still fresh and yummy! I can’t wait to try these Chilean empanandas. I have been looking for a good recipe. My routine when I land in Santiago, Chile, find the nearest empanada stand to hold me until I get to my destination., lol! Thank you soooo much for the Chilean empanada recipe. I was looking for an authentic recipe and found your great site!!!! I made them today and they turned out great!!! Do you make the fried cheese empanadas? I love the cheese ones too!!! Do you have the recipe for the fried cheese empoanadas? I STARTED LOOKING FOR AN EASIER WAY TO MAKE THE DOUGH FOR EMPANADAS. I HAVE BEEN MAKING EMPANADAS FOR MORE THAN FOURTY YEARS.MY KIDS LOVE THEM. I MUST SAY MY EMPANADAS ARE VERY GOOD BUT THE DOUGH IS VERY HARD TO MAKE. I AM CHILEAN,HAVE LIVED IN NORTH CAROLINA FOR MANY YEARS.I AM ALSO A DESIGNER ,OF FLOWERS I OWN CARMEN’S FLOWER BOUTIQUE IN PINEHURST. THANK YOU SO MUCH FOR THE RECEPE I WILL MAKE IT BEFORE THE NEW YEARS. That’s awesome! I always loved the way this dough tasted, and it’s pretty easy to make!! hola!!!! super bueno tu blog!!!!!! I can’t wait to try this recipe. My chileno husband and 1/2 chilena daughter have been asking me to make empanadas forever, although we can find them in Washington, DC. I suspected the dough had Crisco – I was hoping there was another way. Any other fat that would work? Que deliciosas se ven tus empanadas!. Un dia de estos las hare. Estas me traen recuerdos de Chile, familia, amigos, pisco sours, fondas…. Feliz Navidad y un 2014 expectacular para ti y familia. Hi, I was wondering, do you have to use Crisco? Or can you keep it out of the recipe? I noticed the way you close them is different from the traditional fold on sides and top. Do some Chilean people do them this way? Going to give this a shot. I miss having empanadas. Thanks. Estas empanadas (o empanadillas como se diria en mi Puerto Rico) las puedo hacer fritas??? How many empanadas does this yield? Your empanadas look absolutely delicious, but I am surprised that your recipe does not have cumin. How many Empanada’s will this recipe make? I made Chilean Empanada’s few years back and oh my was it so good! Looking forward to making this recipe for appetizers for Thanksgiving! I’m so happy I found this recipe! My husband is Chilean and we live in China. So there’s no way we can find anything that’s even remotely similar to Chilean empanadas. I’ve tried improvising before but it didn’t work out so great. This recipe looks legit. Can’t wait to give it a try tomorro. Thanks so much!! !